Control your presentation from anywhere in the room and highlight areas of the screen using the built-in laser pointer. This presentation remote control helps you deliver seamless presentations by combining intuitive navigation and a laser pointer in a single compact unit.Being confined to your computer isn't the most effective way to deliver a presentation, especially when you're trying to engage your audience.With a wireless range of 90 ft. (27 m), this presentation clicker puts you in control of what's on your screen, giving you the freedom to move around the room while controlling your presentation as if you were at your computer. 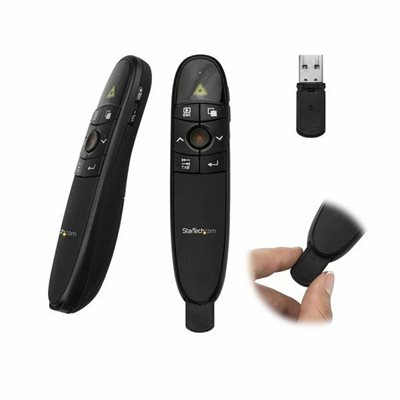 This is ideal for presenting in large lecture halls or conference centers.With a built-in laser pointer, the presentation remote lets you guide your audience's attention to critical information in your content. It's perfect for PowerPoint presentations, websites or any other documents you want to share with your audience.The remote control features a sleek, ergonomic design and includes the required batteries along with a protective carrying case, for total portability. You can store the wireless receiver inside the presentation remote when you're not using it. The USB receiver is supported by generic HID drivers ensuring it will work with virtually any Mac or Windows computer. Being confined to your computer isn’t the most effective way to deliver a presentation, especially when you’re trying to engage your audience. With a wireless range of 90 ft. (27 m), this presentation clicker puts you in control of what’s on your screen, giving you the freedom to move around the room while controlling your presentation as if you were at your computer. This is ideal for presenting in large lecture halls or conference centers. With a built-in laser pointer, the presentation remote lets you guide your audience’s attention to critical information in your content. It’s perfect for PowerPoint® presentations, websites or any other documents you want to share with your audience. The remote control features a sleek, ergonomic design and includes the required batteries along with a protective carrying case, for total portability. You can store the wireless receiver inside the presentation remote when you’re not using it. The USB receiver is supported by generic HID drivers ensuring it will work with virtually any Mac or Windows® computer. The PRESREMOTE is backed by a 2-year StarTech.com warranty and free lifetime technical support.